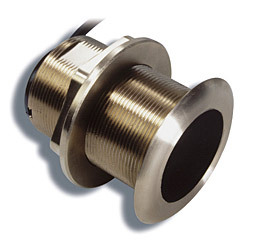 The Garmin B117 600w Bronze Flush Mount Thru-Hull Transducer has quickly become the transducer of choice for boats with up to 7 degrees of deadrise. It has the same performance as the B60 style thru-hull but the element is not tilted. The low profile design does not cause interference with water flow or create trailering issues. Operating Frequency: 50/200 khz with temp. For units with 6-pin transducer connector.